One of the great things about problem solving as a hobby is that so much free information is available these days on problem chess. We have to thank the Internet (and Al Gore??) for that. Although information on chess problems was always fairly free, since there is no copyright on a problem, but now with magazines and books posted every day to the web, you could literally learn chess problems from your PC. You can visit the Chess Problem Database server, which I have mentioned here many times; I've even typed in the name or two of a favorite composer and found all kinds of "buried information" -- like a really nice Christmas problem the German GM Baldur Kozdon did for a small German club, as just one example. The ICCF affiliate Belgische Schaakbord has had their magazine online Echquier Belge- as a pdf for years ("postal" magazines have long sponsored problem columns). It is one of my favorite places to submit my directmates as the director of the problem section there, Ignaas Vandemeulebrocke, helped me through my very first published chess problem. It wasn't something he had to do, but he did and I am forever grateful for that. This column is a sampling of the some of the problems that have appeared in this excellent magazine, and Ignaas has always been able to get some of the best composers to contribute to his magazine. So sit back, and enjoy this month's selection. Thirty eight ladder points are possible. E-mail solutions to [email protected] by September 14. The first of our two "reversed castled" positions, this one by the German grandmaster Ahues is a nice start. Anyone wanting to learn how to make "twoers" would do well with a study of Ahues, who has been composing good ones for more years than most of us have lived. Gebura is a chessplayer as well as composer, and this often shows in his works. I've often admired problems that have an OTB feel if not position, if that makes sense. He has a style that I have imitated in some of my own directmate compositions, although I've never felt I've done better than this one, a pleasing work. I like the optical position this presents; white's "castled queenside" --just on the wrong side of the board! What did the judge like about this? I hope to present it here without giving up too much of the solution. Francesco Simoni (a respected judge and composer from Italy) noted: Pseudo LeGrand -- where the threat in one phase becomes mate in the other and vice-versa, through different black defenses (what else would one expect from one of the LeGrand brothers?). There are two expected plans that fail due to double black coverage. I had to give up my usual dislike of any kind of dual (I am much too compulsive about that) to like this one's solution, but when I did, I could appreciate those composers who compose strictly thematically -- being an old chessplayer by nature I prefer effects to themes, but that is a story for another day. Evgeny is one of my favorite composers. He holds the IM title, wrote an excellent book on miniatures, and his magazine, Chess Leopolis, always has problems I enjoy -- and it is also available as a pdf online! Here he shows a Rukhlis theme in a very nice way. What I enjoy about Evgeny's problems is their construction - you will never see an unneeded piece in any one of them. Now those of you who take this as a challenge -- I will tell you that you can remove at least enough pieces to almost have a miniature (that would be a total of 8!) and retain the solution but lose set and try play. Anyone who wants to comment on this, feel free - it's an interesting experiment in "problem dissection." Just as OTB GMs might bemoan that their best work is "in the notes" and hidden from the public, problemists often note that those who solve by "brute force" are missing out of some of the best parts of a problem. Manolis had one of the first problem pages on the net, although I have not seen much activity from him lately. This problem was taken from his problem pages, and in the spirit of true borrowing (what artist doesn't like to see his work republished - so long as his name is attached to it? ), this one, much like a Giegold problem, is just good fun. Another in my line of "if you don't like this one, you just don't like chess!" This problem combines two problems in one! The first, a Rex Solus (lone king) shows echoed mates in a zugzwang type problem; the second is pure zugzwang! Our next-to-last problem, from a Belgian whose problems I have often admired, is a nice "hunt down the king" type. Experienced solvers will immediately recognize this as a "which way" problem - at least, that is what I call them and will be all the hints you will get! I suppose perhaps one more hint -- I enjoy again the "geometry" of such problems, both the beginning and ending positions. GM Baldur Kozdon is a real favorite of mine. Sometimes criticized for working a position too often, it often is a matter of finding the nuances of a small change in a position that makes his problems interesting. That this problem is about promotion is obvious; after the short decision of which piece to promote to, we see an interesting logical battle between the already standing black rook and white bishop. Like a great classic car, sometimes you stand back and enjoy the worksmanship that went into it, not necessarily the power or speed it is capable of. White can try to put black in zugzwang with either 1. Qe4 or 1. Qd2, where anywhere the e1N moves, white plays 2. Nf2 mate, but black play 1. ... Rf1! White has to cover g2 and f1, so the key is clear. As in the next one, solvers found the key easy to find, but also impressive -- but that is Bob Lincoln for you! I agree - Bob's ability to squeeze so much into simple positions makes me wonder: "Why can't I do that?" With the key, white put black in a terrible zugzwang again. If the a5N moves then 2. Qc6 mate, or if it takes the b7R then 2. Qxb7 mate. Any move by the a7B along the a7-g1 diagonal allows 2. Qa8 mate and on 1. ... Bb8 then 2. Rbc7 mates. I will also note that you have to appreciate the various tries and attempts here, especially 1. Qb5, which is one of those "almost as strong moves," only refuted by the simple block 1. .. Ba7. After the key, black must move the K or promote the a2P. On 1. ... Ka1 white checks with 2. Rc1+ then any capture/promotion on c1 is answered by 3. Qxc1 mate. If black promotes to interpose on b1, then that piece is pinned and 3. Qc3 is mate. 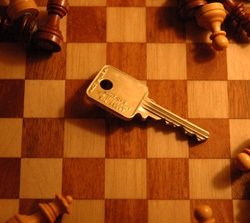 The key threatens the immediate 2. Bd3 mate. Black must promote one of the pawns to attempt to stop the mate. 1. ... a1=N+ 2. Ka4! because the a-file is free and now that the white King is covering the b5 square, nothing can stop 3. Bc8 mate. 1. ... c1=N+ 2. Kc4! like the above line, the c-file now free for us. 1. ... e1=N now the b-file (actually the b4 square) is safe from e1 diagonal promotions, so we again can look forward to 3. Bc8 mate. One main mate I see is to get the a4R to b3 and the d7B to e6. Correct, Tom! Black is mated on a1, a2, or c4 by Bd4# or Be6#. In all cases, white finds a way to force black into a mating net, whether the king moves or the e5 pawn advances. White can not let the Black King escape out on b3. So, after the key, Black has to take on d1 with 1. ... Kxd1 and 2. Ke3 boxes black in. Then follows 2. ... Kc2 and 3. Ba2 (keeping the threat of 4. Bb3 and not letting the black King out via b1). The Black King must return to d1 with 3. ... Kd1 and 4. Bb3 mates. Correct! An attractive forced switchback of the black king. The f4B, g4N and b5P create a nice "northern" barrier that keeps the black King from venturing too far. The key cuts off the c5 square, when black plays 1. ... Kd4 next. Then 2. Be2 keeps black out of the d3 square, and black has to play 2. ... Kd5. Now 3. Bc4+ demonstrates why the d1B had to go to e2 rather than c2. With the bishop on c4, it covers both d5 and d3, so that after 3. ... Kd4 and 4. Kb3, black has to go 4. ... c5. This brings in the last piece on the board (the b6P) which allows 5. Ne6 mate. Of all Tom's comments, I find this one most valuable. A solver to one of my problem noted once that the moves themselves weren't hard to see but "counting" them -- that is, finding the right sequence -- was hard. There is wisdom in such comments. And I will note that black is mated on either a5 or a7: 4...Ka6 5.Rc5 Ka7 6.Ra5#. A small story to end: My friend Mirko grumbled at getting "the last honor" as a prize for this one, but my attitude was different: the judge was the aforementioned Bogdanov, a miniature expert, and anything he considers worthy and new would strike me as deserving - after all, he has probably seen more "minis" than any of us! But all artists are protective of their work, as they should be!